Wow…I thought last week’s Kitchen Aid deal was a good one. But this one beats it for sure! Get a KitchenAid Professional 600 Series 6-Quart Stand Mixer for just $209.99 after $50 rebate (print forms here). They are available in Silver and Cinnamon colors. This is Amazon’s “Deal of the Day,” so there should be plenty of inventory and you won’t have to join a waitlist. If you’ve been thinking about getting a KitchenAid for someone, now’s the time to do it! It kills me to see items like this for sale so cheap right now!! If only I didn’t spend 400 on my kitchen aid! Yes, I know Carrie. It’s painful! 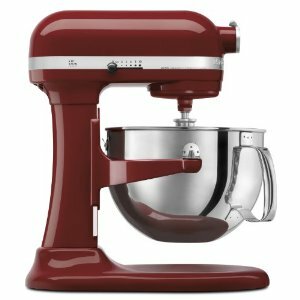 I have one in red to match my red kitchen and just love that mixer. It’s a workhorse. I’ve heard great things about this one…and I’ve heard “workhorse” used before to describe it as well! I’m confused. When I pull this up, it lists as $429.99. How do I find this at the $209.99 after mail-in rebate??? I asked my hubby for this for Christmas, his reply was “what are YOU gonna do with a kitchenaid?? ?” wow, not cool.